the slender pear-shaped body applied with a pair of phoenix in relief, each shown flying with wings displayed and long tail feathers scrolling to one side, above a wide band of lotus petal lappets filled with ruyi motifs carefully drawn in slip around the base, the neck decorated with rising petal lappets in the same technique enclosing scroll motifs on random beaded grounds below the lipped rim and above a key-fret collar in raised lines of “pearl-beading”, the curving tubular spout rising up from the open jaws of a bearded dragon head and joined to the neck by a beaded S-scroll strut, opposite an elaborately moulded handle in the form of a dragon-carp, with a loop at the back of the dragon's head corresponding to a small loop at the edge of the domed cover surmounted by a seated figure of a Buddhist lion wearing a bell on its collar and shown with one paw resting on a ribbon-tied brocade ball, all covered with a glossy pale blue translucent glaze which thins over the raised decoration and pools in the recessed areas to highlight the design, with unglazed biscuit porcelain showing through in a few spots and fired to orange, the underside of the base left unglazed showing the fine porcelain body. This ewer, which is the only recorded example of such large size and elaborate design, shows the skillful application of several new techniques of porcelain decoration invented at the Yuan imperial kilns in the period before painting in underglaze-blue became the dominant decorative style. 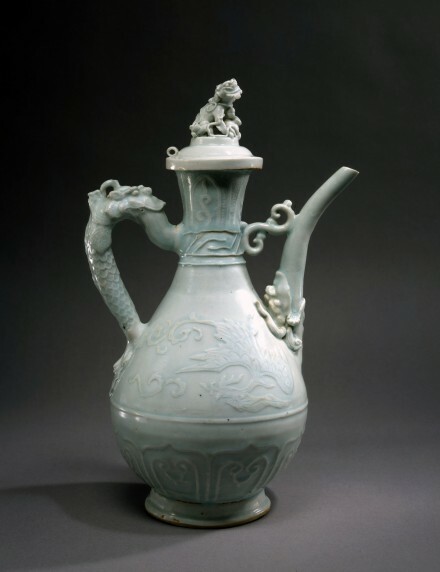 In her discussion of the several innovative techniques developed during the Yuan, including the use of beaded relief, applied slip, complex moulding and finely tooled detailing, Margaret Medley describes this ewer in Yuan Porcelain and Stoneware, p. 22, as "…the most elaborate and splendid example of this unusual style..." and she goes on to say "This fine specimen is of excellent quality of body and glaze, and the execution of the complex design is probably unsurpassed." A smaller and less elaborate Yinqing phoenix ewer and cover of similar form, with plain strap handle and spout, was recovered off the coast of Korea from the wreck of a Chinese vessel which sailed from Ningbo in A.D. 1323, and is illustrated in the catalogue of the Special Exhibition of Cultural Relics found off Sinan Coast, National Museum of Korea, 1977, no. 163. Compare also pair of porcelain vases, with domed covers surmounted by lion knops similar in design and technique to the cover of this ewer, excavated from a tomb dated to A.D. 1324 found near Nanking, approximately fifteen miles from Jingdezhen, and illustrated in Wenwu 1977, No.4, pl.9, fig. 5.